For our actual “Death March” in Cleveland, we started out at Shaker Square on the far East end of town on the border with Shaker Heights. Both the area and Shaker Square itself are pretty interesting: it was one of the United States’ first “Shopping Centers”, designed to mimic Europe’s town squares while integrating some relatively high density housing, transit (trains at the time, now buses), and provide a gateway to the suburbs, and a bit of an open space that serves nicely for the weekend farmers market. Built in a Colonial style, it’s definitely a little dated, but does provide a nice insight into what early 20th century urban planning looked like, and there’s now a theater and a bunch of smaller shops and restaurants around the square. One of these is a joint with a reputation for a good breakfast, Yours Truly, which also served as a nice gathering spot for our hiking crowd. 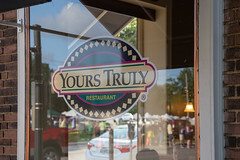 Yours Truly is a Cleveland-area chain (hey, sometimes I review chains…), one that’s been around since the 1980s and is known primarily for their breakfast and lunch (indeed, most Yours Truly restaurants aren’t open for dinner). The restaurant itself is a pleasant enough space, brightly lit with large tables and comfortable seating, and a nice patio outside as well. Menu-wise, it’s your basic American fare; breakfast platters, omelets, pancakes, French toast, and the like. I opted for the “Killit Skillet” described as two big eggs, bacon, sausage, golden hash browns with onion, green pepper, mixed cheese and toasted ciabatta. I thought the “big eggs” was a bit odd (has there been a rash of places serving up sub-sized eggs? 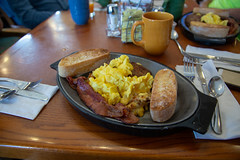 I hadn’t noticed), but I do always enjoy a properly-done breakfast skillet (a long-departed favorite of mine in Minneapolis, Big Olaf’s, did some breakfast skillets that were to die for). And I’ll have to say, I was pretty satisfied with the skillet here: it starts with a pretty nicely executed cheesy hashbrowns with green pepper added as well, cooked up to a nice sear on the veggies and a nice crisp on the potatoes, and a decently scrambled eggs served up over that with two slices of very thick but crisp bacon and two sausage patties. The result was a very satisfying breakfast, one that was going to last me all the way until a mid-afternoon “late lunch” over in Asiatown. Overall, we were happy with Yours Truly, a large, affordable, and satisfying breakfast served up by a friendly staff in an inviting interior in one of Cleveland’s more interesting neighborhoods. I can see why the chain continues to be successful.